A United Launch Alliance Atlas 5 rocket carrying a classified National Reconnaissance Office spy satellite blasted off from Cape Canaveral early Thursday, putting on a spectacular morning sky show before disappearing from view under a familiar cloak of secrecy. While ULA provided live video of the launching, television and commentary ended five minutes later "at the request of our customer." As usual, no additional details were provided. The mission got underway at 8:37 a.m. EDT (GMT-4) when the Atlas 5's Russian-built RD-181 first-stage engine roared to life with a torrent of flame, generating 860,000 pounds of thrust. After computer checks verified engine performance, two solid-fuel strap-on boosters ignited and the rocket was released from its firing stand at launch complex 41 at the Cape Canaveral Air Force Station. The initial moments of the ascent went smoothly as the towering 20-story rocket knifed through a clear morning sky and arced away to the east above the Atlantic Ocean. Spectacular "rocketcam" views from a camera mounted on the side of the Atlas 5 showed the Kennedy Space Center and Cape Canaveral Air Force Station dropping away below with the long shadow of the booster's exhaust trail stretching away to the west. Moments later, the limb of the Earth and the deep black of space came into view as the Atlas 5 accelerated toward space under the power of its first-stage engine. The Russian powerplant shut down about four minutes and 10 seconds after liftoff. The spent first stage then fell away and the Centaur second stage's hydrogen-fueled Aerojet Rocketdyne RL10C-1 engine ignited to continue the boost to orbit. Seconds later, with the rocket well out of view, the protective nose cone fairing fell away as planned. But in keeping with NRO policy governing classified launches, ULA's television coverage and commentary ended a few moments later and no additional details were provided. Ted Molczan, a respected independent satellite analyst, said before launch that he believed the payload likely is the first in a new series of communications stations designed to relay imagery from current and future high-resolution optical spy satellites. The conclusion was based on the rocket's trajectory, gleaned from notices to airmen and mariners along the booster's flight path, its lift capability and other factors, including the size of the payload firing protecting the satellite during launch. But in an email sent to fellow satellite trackers, Molczan said he could not rule out the possibility that the satellite launched Thursday might be a signals intelligence spacecraft, although he did not think it likely. In either case, the trajectory indicated the satellite was bound for an orbit 22,300 miles above the equator where communications relay stations are positioned. 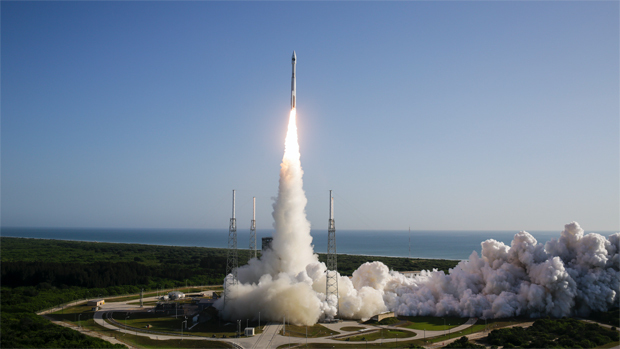 This was the 64th successful launch in a row of an Atlas 5 since the rocket's maiden flight in 2002 and the fourth of 10 flights planned this year. It was the 70th flight of an RD-180 first-stage engine and the 13th for the Centaur stage's RL10C-1 engine.